A personal blog for me and mine only. A place to go and recall my recipes before senility kicks in. Cooking by taste,. No quantities here, taste and feel. Not all shopping is therapy but Open Market Food Shopping is an energy booster of another kind. It can be nourishing, exhilarating and always surprising. The colours, the smells, the very sound of LIFE itself. I go with a list but often stray as you can never know what's abundant on that day (and usually cheapest) Much like flea markets, go with a 'general ' search but be open to grab unexpected opportunities. 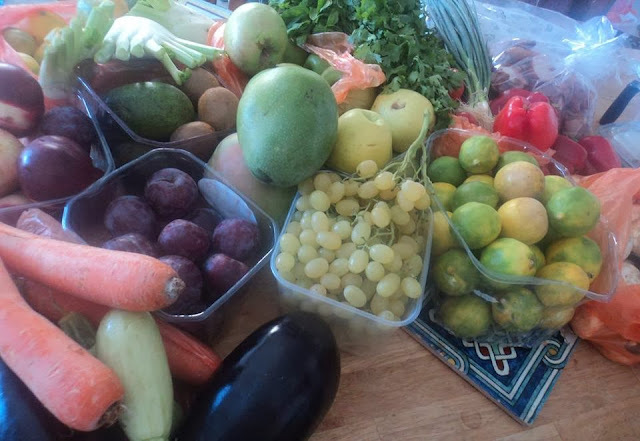 I love shopping at the shuk and getting bargain prices, most of the produce here were at atleast 1/2 price or even less, lemons, kiwis, plums, nectarines, apples, peppers, carrots, courgettes, aubergines (shakshuka) tomatoes. So the lemons here are not perfectly yellow and glossy. They ARE thin-skinned and bursting with juice. The tomatoes juicy soft, if not used immediately are painlessly moved from fridge to freezer for perfect sauce- making at a later date, nothing wasted! Reduced priced doesn't mean a lesser quality, on the contrary it means they are ripe now!, it could also mean they are less 'attractive' and weird shaped but perfectly tasty and consumable. For fruit or veg shakes who's going to see or even care the shape of the fruit? 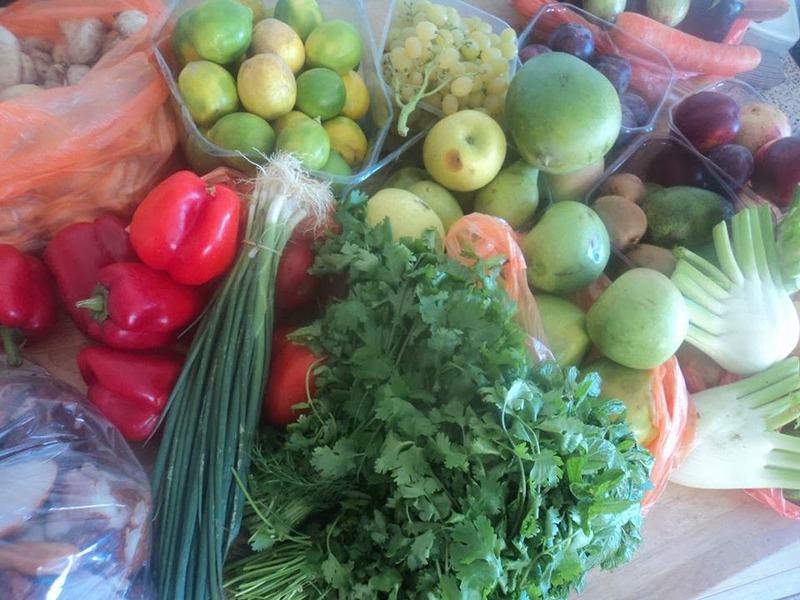 Plus fully ripe produce makes the best flavourful drinks ever. So what the apples are a bit blotchy, they'll do very nicely once cleaned and cubed in a freshly baked apple pie and hey! at 1/3 of the regular price who's going to know the difference. Taste will be the same if not better as these apples are at their peak! The bag on the bottom left is a bag of assorted salamis, pastramas and other cold meats ,also at reduced price (perfectly fresh, just the ends of, or close to the ends of the roll). Used for either sandwich fillers, omelettes, pasta, pizza topping or simply frozen for a lovely minestrone soup some wintery day. In essence what the buyer is paying is TIME. The longer the shelf life, the longer the time we have before we MUST use it or loose it. 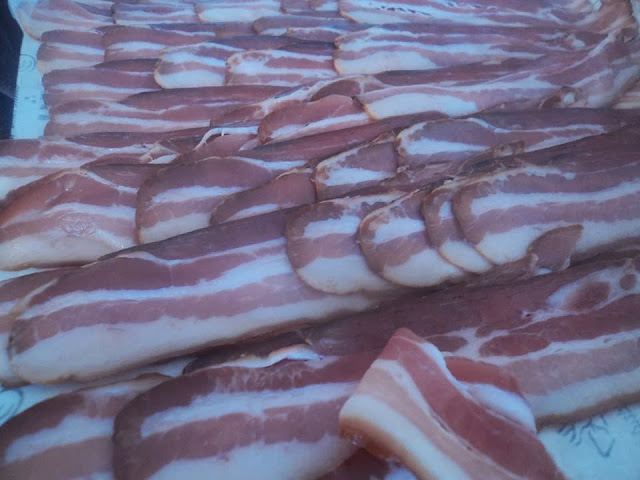 Couldn't resist adding this lovely display of bacon. Both my sons have tried to follow the fad and be vegetarians, then they say Mum goes on "Bacon Alert!" and all their hopes are dashed. All content and photos copyrighted. All rights reserved. Please seek permission before republishing.